Leonard G. Horowitz, DMD, MA, MPH, DNM, DMM, is an internationally known authority in public health and emerging diseases. Honored as a “World Leading Intellectual” by the World Organization for Natural Medicine in 2006, he has authored 16 books, including 3 American bestsellers, addressing the most controversial subjects in health science and geopolitics. Sherri Kane is an investigative journalist who interned with FOX News and resigned for ethical reasons to pursue a career in independent broadcasting and the performing arts. She currently serves as the CEO of HealthyWorldOrganization.org, a non-profit natural health care advocacy group advancing as an alternative to the World Health Organization (WHO). Conflicting interests damagingly taint health science and medicine. The media has been most influential in this process. Pharmaceutical propaganda facilitates geopolitical and financial agendas particularly obvious in recent years concerning the H1N1 pandemic. In this regard, social conditioning, legislation, and health care administration has been profoundly impacted by propaganda. This study examines a new genre of public health-related Hollywood films, advanced by Michael Moore, funded by “genetopharmaceutical” industrialists and media propagandists. The authors evidence a “hostile takeover” of health science and medicine that has occurred, affecting care providers and consumers worldwide. They urge consideration of the financial forces involved advancing centralized international governance, World Health Organization (WHO) directives, and a new society assimilating eugenic theology merged with biotechnology for “genetopharmaceutical” industrialization. In 2002, The Lancet declared the practice of medicine “heavily, and damagingly” tainted by conflicting interests. Alarmed by unethical practices in drug sales and science, the editors envisioned the crippling of the profession due to widespread fraud. The media, according to Albert Bandura, influence the medical “mind-set” and behavior of people worldwide most powerfully. Stronger than the influence of parents, teachers, and peers, is the persuasive role television and film plays in learning, behavioral conditioning, and social engineering. Propaganda originated in 1622 by order of Pope Gregory XV to establish the Congregatio de Propaganda Fide to promote Catholicism. Political propaganda methods advanced by the late 1700s. "Derived from this celebrated society [for propagating the faith], the name propaganda is applied in modern political language as a term of reproach to secret associations for the spread of opinions and principles which are viewed by most governments with horror and aversion." Hollywood’s use of propaganda is best documented in the film Hollywoodism - Jews, Movies and the American Dream, directed by Simcha Jacobovici. Horowitz evidenced the extensive use of propaganda more recently in the documentary In Lies We Trust - The CIA, Hollywood & Bioterrorism, in which official censorship of science was advanced by the US Department of Health and Human Services in their “History of Bioterrorism,” undermining the credibility of “emergency preparedness” appeals. In recent years, a new genre of Hollywood films has emerged called “edutainment,” addressing documentary-like themes. Profitability in the field was demonstrated by “independent film-maker,” Michael Moore, who produced the three most lucrative documentaries in film history. In this “study,” we consider the role Moore plays in emerging geopolitics involving social engineering to advance multinational corporate interests shared by leading pharmaceutical industrialists. Based on the evidence cited here, we conclude Moore’s films are propaganda and diversion. These covert operations undermine ethical progress in science, medicine, and public health. The agenda advances the risk of species-wide genetopharmaceutical bio-mutation and omnicide. "those who call yourselves Christians (Muslims, Jews, Buddhists,... etc.)." He challenged every American’s theology as contrary to Capitalism. His message was more than a promotion for his film, Capitalism - A Love Story. “What would Jesus do?” about America’s sick and poor who have no means to heal or sustain themselves under Capitalism. This film was Moore’s third in a row co-produced by The Weinstein Company, part of the Disney-ABC-Miramax merger administered by Goldman-Sachs’s CEO Lloyd Blankfein. Blankfein’s firm provided a $490 million private placement to The Weinstein Company in a deal engaging Goldman-Sachs in an “ongoing relationship with The Weinstein Company," according to the latter’s press release. In addition, Moore’s other co-producer of Capitalism, is Paramount Vantage, controlled by Viacom, on whose board sits Sumner Redstone, and former Bear Stearns executive Ace Greenberg. Associated with these parties, especially Blankfein, who Moore vilifies in this film as the quintessential capitalist, are several of the world’s wealthiest pharmaceutical industrialists and billionaire media moguls that capitalize on plagues, fear, and population control. 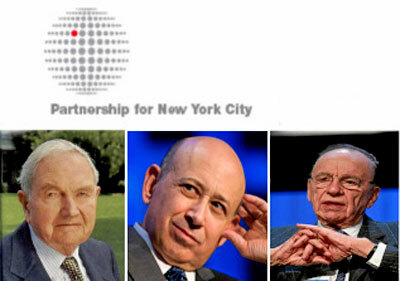 Lloyd Blankfein is co-chairman with media mogul Rupert Murdoch in the David Rockefeller-founded Partnership for New York City (PFNYC), chartered by the Royal Family of England. This group is currently advancing a world leading biotechnology trust, heavily invested in “genetopharmaceuticals” and flu vaccine genetic engineering. Members of this group, along with George Soros-directed assets, virtually monopolized the genetics industry during the 1990s, culminating in the corporate privatization of the Human Genome Project. ...was directed by Mr. Tony White, Soros’s appointee to lead the privately owned Applera Company following their obvious heist of the Human Genome Project during the late 1990s. The sudden privatization of what had previously been public, non-profit, patentable property, also implicated co-sponsors - the U.S. Department of Energy and The Wellcome Trust of London. Today, the American Baxter Company is a major H1N1 vaccine maker for European nations, and at the center of controversy concerning the expanding outbreak of recombinant H1N1-hemorrhagic pneumonia. Many experts conclude the 2009 H1N1 triple reassortant sourced from a lab, similar to its 1977 relative. Rupert Murdoch’s mother, Elizabeth, Dame Commander of the Most Excellent Order of the British Empire, and daughter-in-law, Sarah Murdoch, steward the Royal Women’s Hospital and Murdoch Children’s Research Institute, respectively, in Australia. They oversaw their staff conduct H1N1 vaccine trials on infants, children, and pregnant women in 2009, collaborating with Merck’s subsidiary, CSL. Furthermore, Rupert Murdoch’s son James oversees GlaxoSmithKline, another major H1N1 vaccine maker. Regarding efficacy, and more importantly safety, the CSL/Merck H1N1 vaccine tested in Murdoch-family directed facilities was simply assumed to be both safe and effective according to its package insert. Since no inactive placebo control such as saline was used, the study design was obviously flawed, confounding, biased, and arguably fraudulent. It may have precluded observing statistically significant differences between experimental and control groups falsely evidencing safety from lacking adverse event differentials. This intentional obfuscation exclusively benefited those with conflicting interests, and/or those inclined to rely on safety assurances to the detriment of public health and medical science. Yet, Murdoch-directed News Corp. assets heavily promoted these risky H1N1 vaccines as urgently required, safe and effective. The Wellcome Trust’s alleged divestment of conflicting pharmaceutical interests following Burroughs Wellcome’s sale of stock to Glaxo PLC, created GlaxoWellcome, currently GlaxoSmithKlein. This allegation of “divestment” is discredited by more than the fund’s involvement in the Human Genome Project’s pirating, implicating George Soros and David Rockefeller-linked investors. Again, GlaxoSmithKlein makes the H1N1 vaccine, and Rupert Murdoch’s heir apparent, James Murdoch, oversees their Board of Directors. And that’s not all... Rupert Murdoch’s Co-Chairman of the PFNYC, Lloyd Blankfein is a major shareholder in the Goldman-Sachs/AstraZeneca partnership. He directed AstraZeneca’s $15 billion acquisition of MedImmune, the H1N1 FLUMIST maker. Besides James and Rupert’s News Corp directing film makers Twentieth Century Fox and Warner Brothers, the Western World’s mass-mediated mind-set is reinforced by PFNYC “partner” and Reuters News Service CEO, Thomas H. Glocer. Glocer sits on the Board of Directors of Merck & Company, whose (CSL) H1N1 vaccine, and (Merck’s) Pneumovax vaccine, is broadening markets as the main ingredient - laboratory engineered H1N1 virus - mutates, as in the Ukraine, becoming more deadly. KKR, owning chains of supermarkets and cinemas, RJ Reynolds Tobacco, Nabisco, and much more, recently granted a miniscule $1.25 million, according to their press release, to assure the aforementioned partners will lead the world’s biotech research and developments from New York City. Their executive offices are planned for leasing in the planned new World Trade Center, administered by PFNYC property manager Larry Silverstein of 911 infamy. Michael Moore prescribes “Socialism” as a remedy for capitalism’s casualties. Mussolini struck an alliance with Hitler’s Third Reich to advance, like Moore’s intertwined backers, a “Neuordnung” (New [World] Order) based on “National Socialism” from which the word NAZI (Nationalsozialistische Deutsche Arbeiterpartei or National Socialist Workers Party) derives. The Rockefeller-Soros financial axis had foreseen, arguably directed, the current global economic collapse as foretold in three previous books by Soros. Therein, Soros encouraged investments in the same form of global government Moore encourages by attacking capitalism. “a strong central international government to correct for the excesses of self-interest." Moore’s PFNYC “partners,” biotechnology and pharmaceutical industry directors, share his affection for “philanthropy, philosophy, and politics.” They prescribe corporate fascism (i.e., “Socialism”) as a cure for the current financial crisis. Moore’s Capitalism, like all Western World persuasive media broadcasts, advances Soros’s economic solutions advanced in his book, The New Paradigm for Financial Markets. Thus, the need for Moore, films like SICKO, and mainstream media propaganda that direct the “turbulence”... (e.g., “controlled opposition” films such as Capitalism, Bowling and Fahrenheit 911). Distraction, deception, and marketing persuasion via the media and silver screen on behalf of the “SICKOs” discussed above is Moore’s trade. His investors’ hidden agendas are now transparent. His three blockbusters are propaganda pieces promoting his financial backers’ philosophies and New World Order policies, even their “philanthropies,” that Moore muses about in his forthcoming film. All of this advances the politics, and public acceptance, of strong centralized international governance, banking, and a new eugenic theology advancing one world religion worshiping biotechnology and “genetopharmaceutical” industrialization. SICKO irks us similarly about the inadequacies of health insurance, but neglects allopathic monopolization for “disease control” and population reduction. “We The People” are dying from petrochemical-pharmaceutical intoxications, not simply financial manipulations and political impositions sourced by Moore's backers. We now pierce the veil of the silver screen to diagnose the agendas of the world’s wealthiest investors. These members of the PFNYC - philanthropists funding eugenic non-profits, such as The Wellcome Trust and Population Council - are killing us. Our overpopulation as “human resources” threatens revolutions risking their status quo. IF the sincere professional ethical intention in medicine is to do good, and “above all do no harm,” the facts evidenced herein compel urgent attention to this “hostile takeover” and crisis in stewardship of the healing arts and sciences. Failure to attend to this sociopathic global urgency threatens extinction of the human race.